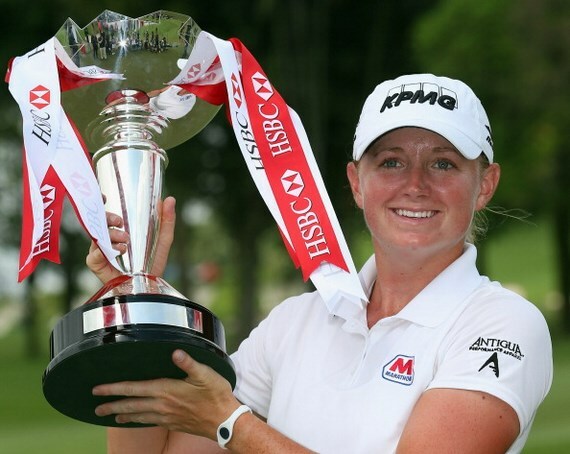 Stacy Lewis made history in 2014 by becoming the 1st American to win the LPGA "triple crown" in 21 years. Lewis captured the Rolex Player of the Year award for the 2nd time in 3 years, the Vare Trophy (for lowest scoring average) for the 2nd year in a row, and the year end Money List title with more than $2.5 million in winnings. By winning the ShopRite LPGA Classic for the 2nd time in 3 years, Stacy Lewis not only won her 10th LPGA tournament, but she climbed back to #1 in the world rankings, snapping the 59 week reign of Inbee Park. This is Stacy's second visit to the #1 ranking. Last year, 4 weeks after reaching this lofty goal in April, Inbee Park went on an unprecedented tear winning 3 majors in a row and snatching the #1 ranking from Stacy. But Stacy played spoiler at the 4th major by winning the British Open and then this year by winning twice. So, she's back to #1 and she has earned it! Her consistency has been incredible – she leads just about every important statistical category! In addition to winning this week and becoming the #1 ranked player in the world, Stacy found time to go to Pinehurst for some pre-US Open practice rounds on Monday and Tuesday, then play in the pro-am at ShopRite on Wednesday and then fly in a helicopter to New York to help make the biggest LPGA tournament announcement in decades. 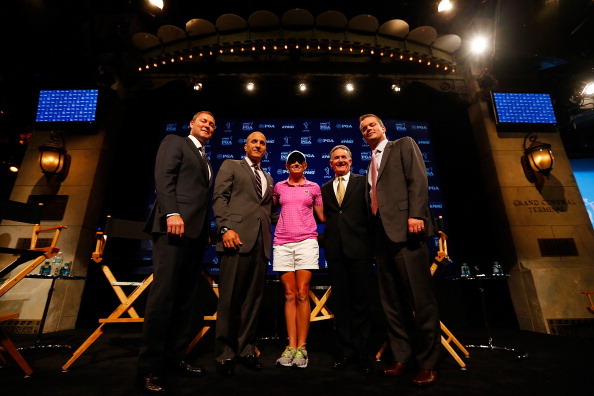 On the Saturday Night Live stage at 30 Rockefeller Center, Stacy joined LPGA Commissioner Mike Whan, PGA of America CEO Pete Bevacqua, KPMG Global Chairman John Veihmeyer and Golf Channel President Mike McCarley to announce the new LPGA flagship major, the KPMG Women's PGA Championship. Everything about it will be big, from storied venues (Westchester CC in 2015) to network TV coverage on the weekend, to the purse ($3.5m). But a key difference in this event was the inclusion of a Women's Leadership Summit that will take place during the tournament. The summit will bring together the top women in business, government and sports in order to promote the ascension of women in the workplace and in society, a cause that is close to Stacy's heart. Stacy played a prominent role in the creation of this event and she will have a continuing role on the advisory board of the women's leadership summit. That's a busy week! There's nothing like winning at home and even though home is really Houston and not Dallas, Stacy won her 9th LPGA event surrounded by family and friends! After winning the LPGA Player of the Year honors for 2012 – something that hadn't been done by an American in 18 years - Stacy finished off 2013 by winning the LPGA's award for best scoring average – the Vare Trophy. What a way to finish off a great year! Winning her 2nd major at the Old Course at St. Andrews, the home of golf, by coming from behind with birdies on the last two holes – does it get any better than that? Stacy Lewis won her third tournament of 2013 and, in the process, stopped Inbee Park's bid to win 4 majors in a row – the Grand Slam. After reaching the #1 ranking in March and holding it for 4 weeks, Stacy was passed by Park, who went on an unprecedented hot streak including 3 major wins in a row and overtaking Stacy for the #1 spot. But, by winning the Ricoh British Open, Stacy stopped another streak, by becoming the 1st non-Asian player to win a major since she won the Kraft Nabisco in 2011. The win also narrowed the gap between the top two players in the world and may be the beginning of another run to the #1 ranking. Going into the Ricoh Women's British Open, Stacy was feeling pretty good about her chances. After all, she played her last amateur event at St. Andrews at the Curtis Cup, where she made history by achieving a 5-0 won/loss record and leading the US team to a commanding victory. She loved the course then and the Old Course loved her back on this major occasion. And her timing could not be more perfect as she will now lead the US team against the Europeans, this time at the biennial Solheim Cup, to be played in Colorado in two weeks in an effort to win back the Solheim Cup. Whether it is winning a major for herself, or representing her country against the best golfers in the world, Stacy Lewis is proving time and again that she is the American face of golf and an inspiration for millions around the world. 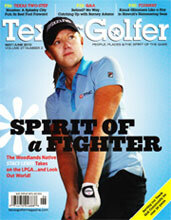 See what Stacy's been up to off the golf course during spring & summer of 2013. 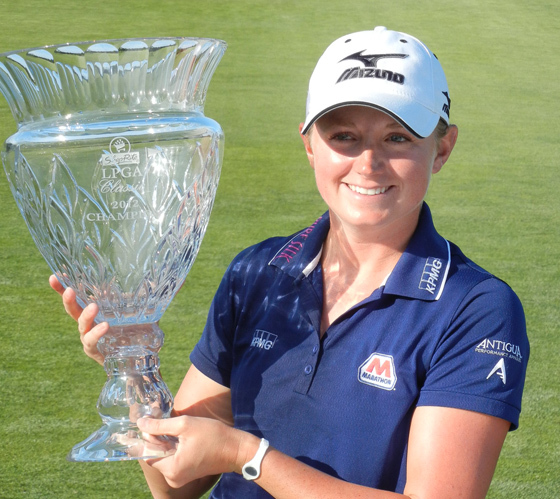 THE WORLD HAS A NEW #1 and it's STACY LEWIS! 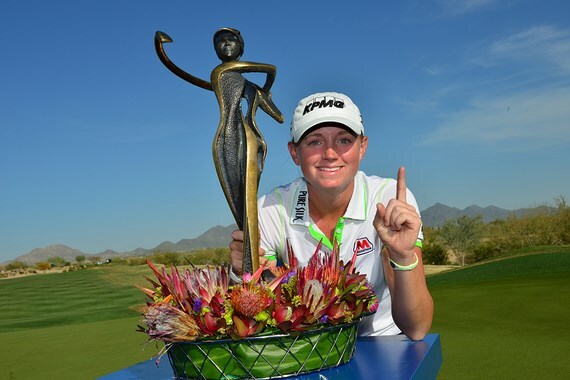 Stacy Lewis won her second tournament in a row at the RR Donnelley LPGA Founders Cup in Phoenix, Arizona and by doing so, became the #1 ranked player in the world! And true to form, she did it in dramatic style after incurring a two-stroke penalty after her 3rd round caused by her caddie's inadvertent error. Rather than starting the final round two strokes behind leader, Ai Miyazato, she would start four strokes back. But, undeterred, she and her caddie stalked the leader until Stacy blew past her with 2 holes to play. She closed out the tournament with a final round 64, a new tournament scoring record, and the elusive #1 world ranking! After winning her first LPGA major at the 2011 Kraft Nabisco Championship, Stacy has won 6 times in the span of 23 events - an incredible streak of consistency! And now that she has reached her goal of being #1 in the world, the media has been asking if she thinks it will be difficult to stay there? The best way to answer that might be to ask, "Can it be any harder than wearing a body brace for 18 hours a day for almost 7 years and becoming an NCAA & 7-time LPGA champion with a surgically fused metal rod in your back?" See how the media covered this inspirational achievement. 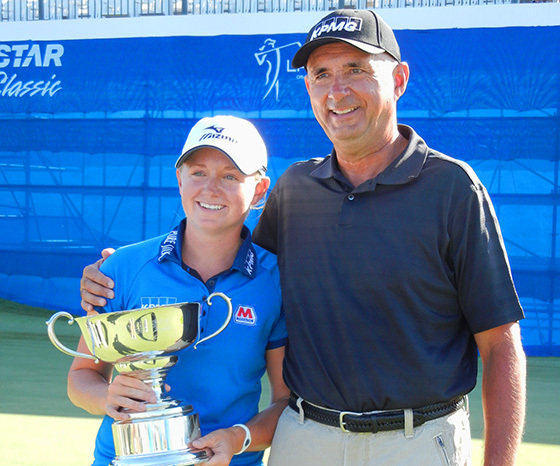 Stacy Lewis has started 2013 right where she left off in 2012 when she won Player of the Year. After finishing T15 at the Australian Open and T3 at the Honda LPGA Thailand, Stacy won her 1st event of 2013 in Singapore, and her 6th tournament in 2 years, by claiming the prestigious tournament of champions called the HSBC Women's Champions. In so doing, Stacy took over the top spot on the LPGA's Money List and has taken dead aim at the world #1 ranking by closing the gap between her and Yani Tseng to just about half of one point. As Stacy takes care of business on the course, you might have noticed a few small changes that were made off the course during the off-season. Stacy is now sporting a slightly new look this year, by wearing a new hat with KPMG making a move from her shirt to the front of her hat. And if you are a fan of EA's Tiger Woods PGA Tour video game, then you'll be an even bigger fan given that Stacy Lewis will be featured in the 2014 version due out on March 26. Now, you'll be able to play the Kraft Nabisco Championship as Stacy Lewis or a few other LPGA players. But, Stacy will put her hat away as she gets in her Sunday best for her induction into the Arkansas Sports Hall of Fame on Friday, March 8 in Little Rock. This means a lot to Stacy especially since Arkansas holds such a special place in her heart. The story which served as an introduction to Stacy's Hall of Fame induction appeared as a Sunday feature in the Arkansas Democrat-Gazette entitled "Iron Will" by Rich Polikoff and you can read it right here and here. 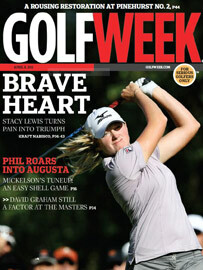 Stacy Lewis voted PoY by the Golf Writers Association of America. Lewis Wins LPGA Player of the Year & Makes LPGA History! At the awards ceremonies held Friday, November 16 during the season-ending CME Group Titleholders event, the LPGA honored Stacy Lewis with its greatest prize - the Player of the Year award. 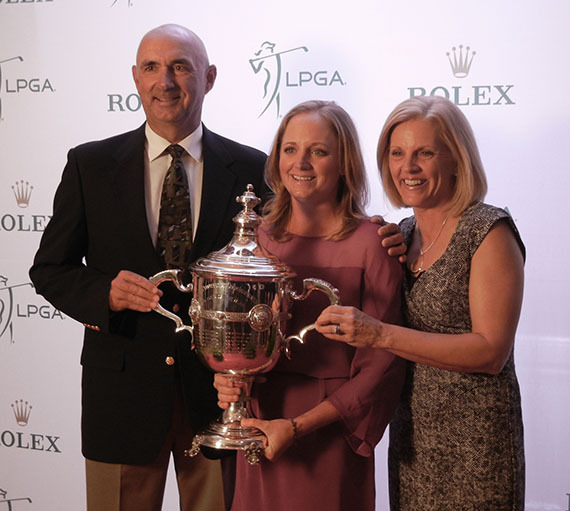 With a tour leading 4 wins this year and almost $2 million in earnings, not only did Stacy Lewis enjoy a breakout season, she became the first American to win the LPGA Rolex Player of the Year award in 18 years. Beth Daniel did it in 1994 and, fittingly, it was she who presented Lewis with the award. In her moving acceptance speech, Lewis described her struggle with scoliosis and the journey that had brought her to the PoY award. And when she thanked the many people who had helped her along the way, especially her parents, there was not a dry eye in the audience. But, making history was not all she did this week. On November 15, Electronic Arts announced that Stacy Lewis would be included in the newest version of their "Tiger Woods PGA Tour" golf video game. 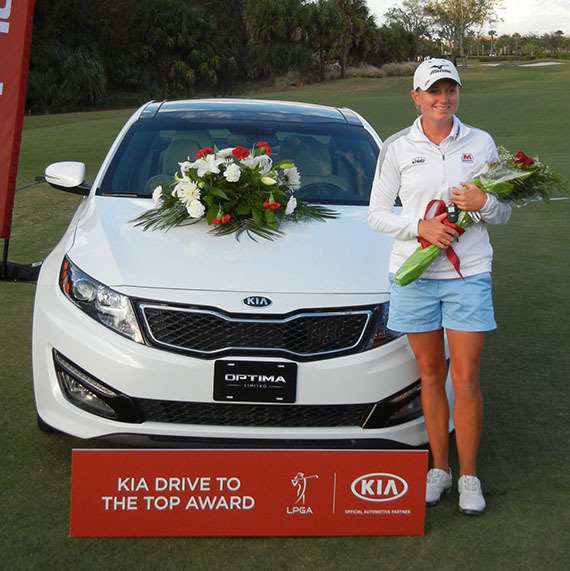 Stacy was also presented with a brand new Kia Optima Limited for winning the Kia Drive to the Top award, given to the LPGA player who finishes the season with the most Top 10 Finishes. And, just to put a little icing on the cake during a one day event that took place on Monday following the CME Titleholders, Stacy partnered with Betsy King to win the ISPS Handa Heroes Charity Event. Stacy and Betsy earned a collective $60,000 for their charities Scoliosis Research Society (SRS.org) and Golf Fore Africa (GolfForeAfrica.org). Stacy followed this event by announcing that she would also donate a further $20,000 to the SRS. She did it again! 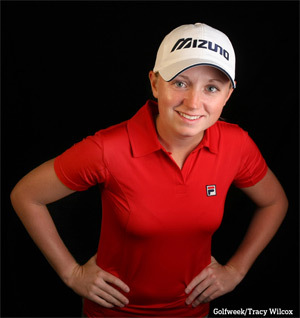 Stacy Lewis won for the 4th time in 2012 by winning the LPGA's Mizuno Classic in Japan – a tournament sponsored by her very happy golf club sponsor Mizuno. This time, Lewis came from 7 shots back by firing a final round 64 that included birdies on the last three holes to win by 1. She now has a virtually insurmountable lead in the LPGA Player of the Year (PoY) race with two tournaments remaining. Should Lewis win the PoY award, she would become the first American player to win that award in 18 years. If that wasn't impressive enough, Stacy's success so far need not be qualified to women's golf. 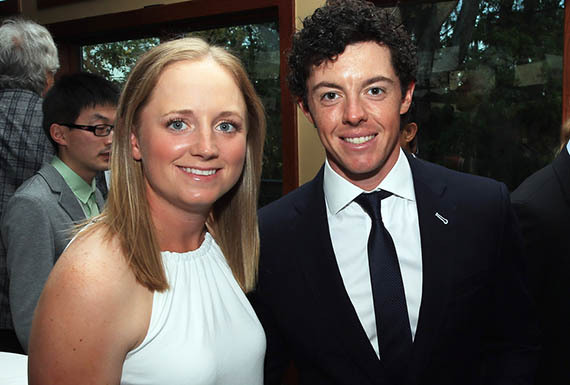 On golf's two major tours, there are only 2 players who have won 4 tournaments this year – Stacy Lewis & Rory McIlroy. Who knew Rory was that good?!?! Stacy loves Alabama! How else to explain her recent win at the Navistar LPGA Classic in Montgomery! Combined with her win in April at the Mobile Bay LPGA Classic and the ShopRite LPGA Classic in June, Stacy has not only swept both Alabama events, but she has joined Yani Tseng as the only player to have won 3 times in 2012. In so doing, Stacy's Rolex World Ranking rose to #2 and she is the only American player ranked in the top 12 in the world. So, it's no wonder her father, Dale looks so proud in this picture above. It's also obvious why there are so many fans lined up to get her autograph below after her win. She loves Alabama and Alabama clearly loves her! As the LPGA Tour season enters the home stretch and heads to Asia for 4 tournaments overseas, a quick look at Stacy's stats reveal just how well she playing. Of the 20 categories that the LPGA tracks that are relevant to Stacy, she leads the tour in 8 of them, including Rounds in the 60's, Birdies, Eagles and Top 10 finishes. In fact, so far, Stacy has finished in the top 10 14 times this year which means that she is in contention 67% of the time. Even more remarkably, she ranks either #1 or #2 in 12 of the 13 most important statistics, like Greens in Regulations (GIR) and Putts per GIR. Statistically, Stacy Lewis is enjoying a dominant year! 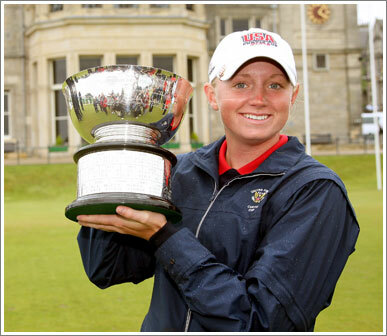 On June 3, 2012, Stacy Lewis won her 2nd LPGA tournament of the year and the 3rd of her career at the ShopRite LPGA Classic, by a convincing 4 strokes! In so doing, she officially supplanted Cristie Kerr as the top American player in the world! The “Next Great American Golfer's” time has finally come! Further, Stacy's Rolex World Ranking climbed to #3! At the beginning of the year, Stacy set a goal to become the top ranked American player in the world. After winning twice in 5 weeks, she has achieved that before reaching the half-way point of the season! But actually, the timing couldn't have been better because June is Scoliosis Awareness Month which has been recognized by about half of the states in the union. 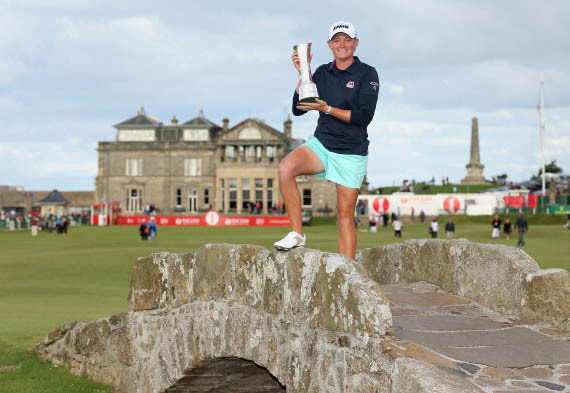 On Sunday, June 3, with her win and her move to the top of the ranks of American golf, Stacy seems to have declared that there has been a changing of the guard in US women's golf and Stacy looks very comfortable perched on the very top seat! 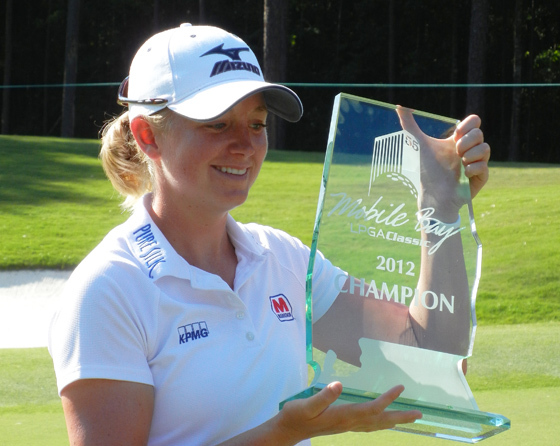 On April 29, 2012 in Mobile, Alabama, Stacy Lewis played 4 rounds in the sixties and won the 2nd LPGA tournament of her career. In doing so, her Rolex World Ranking improved to #7 and is poised to surpass Cristie Kerr as the #1 American golfer in the world. When Stacy decided to double major in finance and accounting at the University of Arkansas, she knew that it would be a heavy academic load to carry, especially while playing on the varsity golf team, but she knew that someday, it would pay off for her. Well, it has paid off a bit sooner than expected. 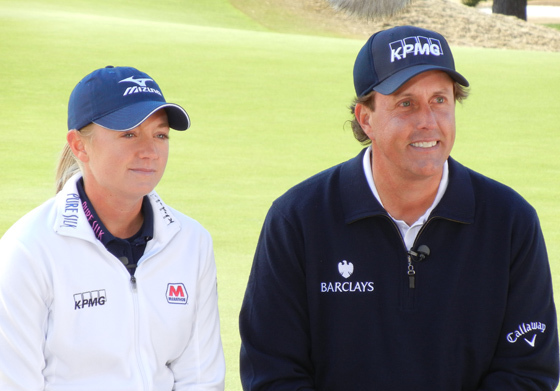 On the eve of defending her Kraft Nabisco Championship title (March 28, 2012), Stacy announced her new sponsorship relationship with KPMG, one of the world's "big 4" audit, tax and advisory firms. Read the Press Release. Attending the announcement, KPMG's Chairman & CEO, John Veihmeyer, made reference to the emergence of women in leadership roles in the business world and how a relationship with Stacy demonstrates KPMG's commitment to women amongst its clients and the KPMG family. The sponsorship also symbolized the recognition, by a global best-in-class company, that women's golf is on the move and that the LPGA platform is growing in its reach and importance to main stream sponsors. Also joining Stacy Lewis and John Veihmeyer on stage were LPGA Commissioner Mike Whan, and Kraig Kann, the LPGA's Chief Communications Officer. If you missed it, you can see both the website that was created for Stacy by KPMG as well as the TV commercial that ran during the Kraft Nabisco Championship at www.KPMG.com/Stacy. Oh, and by the way, in her title defence of the KNC, Stacy made a heroic charge on Sunday, shooting 66 (that's 6 under par) in her final round to come within 2 strokes of the eventual winner! 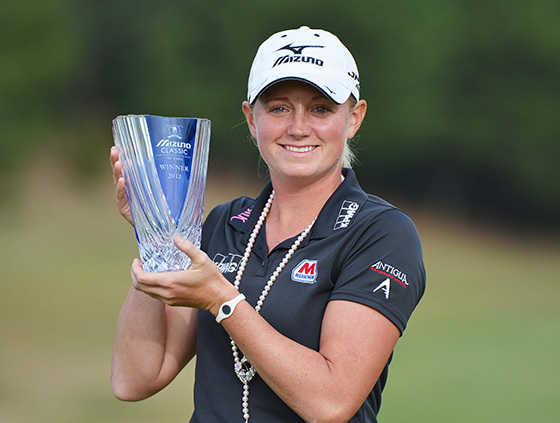 Marathon Petroleum Corporation announced today that it has signed a sponsorship agreement with Stacy Lewis. The 26-year-old professional golfer is coming off a memorable 2011 season in which she captured her first major at the Kraft Nabisco Championship, had 12 top ten finishes and was ranked fourth on the LPGA money list. Read the entire Press Release. New season, new look! Stacy will be playing the 2012 season in a brand new apparel brand - Antigua. The Antigua Group is a leading designer and marketer of lifestyle apparel and sportswear under the "Antigua" label and can be found in the best golf courses and retailers around the country. Antigua also makes apparel under license from a number of pro leagues including the NBA, MLB and the NHL. Read the Press Release. 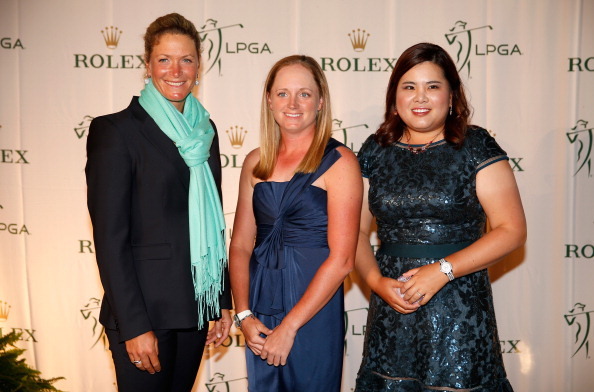 The 2011 LPGA season is finally over and the year-end numbers speak for themselves. All of the above translated into a magical season playing in 13 countries, participating in dozens of pro-ams, playing for her country in her first Solheim Cup, conducting hundreds of interviews, appearing on TV on multiple shows and signing thousands of autographs. And perhaps more importantly, her new elevated platform allowed to connect with and inspire thousands of more girls who have the same spinal condition (scoliosis) as her. 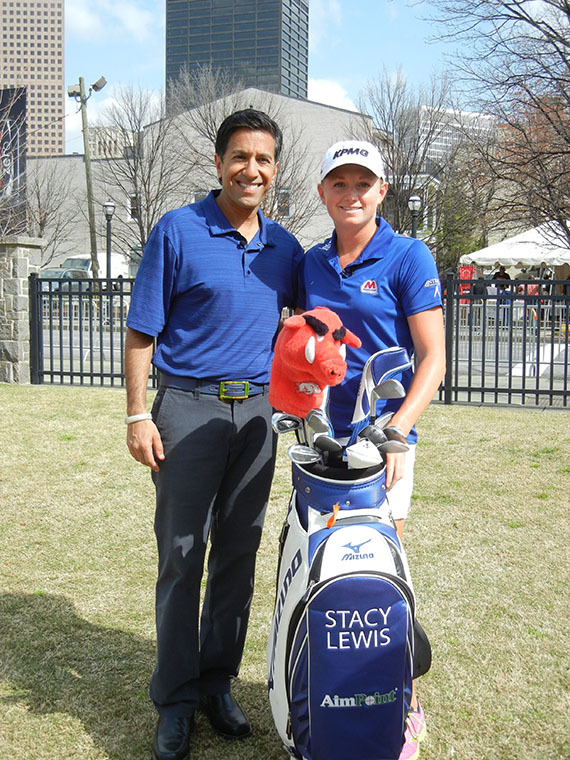 With the 2011 LPGA season drawing to a close, Stacy Lewis has clearly established herself as one of the very best golfers in the world. She has maintained her hold on the #3 position on the Money List for most of the season and is close to claiming bragging rights as the "best American player"! Stacy has been quite busy off the course as well. She's appeared on the Golf Channel's Morning Drive, ESPN First Take, CNN International as well as in newspapers and magazines from Malaysia to Mexico to Toronto. 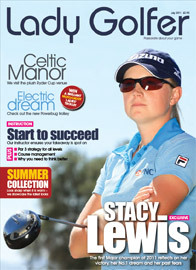 She also appeared on another cover, this time on Lady Golfer, the leading golf magazine for women in the UK! She also found time to meet with and inspire scoliosis patients from Illinois to Malaysia! Stacy has even gone climbed into the Golf Channel broadcast booth to try her hand at commentary during the ShopRite LPGA Classic in June. On the course, Stacy has turned in a total of 11 top 10's including two 2nd place finishes at the Evian Masters and the CN Canadian Women's Open. Stacy also achieved her goal of representing her country at the Solheim Cup. In September, twelve of the best players from the United States travelled to Ireland to compete in the twelfth rendition of the biannually held event against the top 12 golfers from Europe. When it was all over, Europe came back in the last 30 minutes to win for only the 4th time in the event's history. Despite the loss by the American side, many considered this the most exciting Solheim Cup of all time. While it didn't end the way that Stacy would have wanted to end, it was every bit the experience that she thought it would be! To represent the United States under the most pressure packed situations is an honor and challenge that Stacy will look forward to every two years! On April 3, the best story in golf got even better! 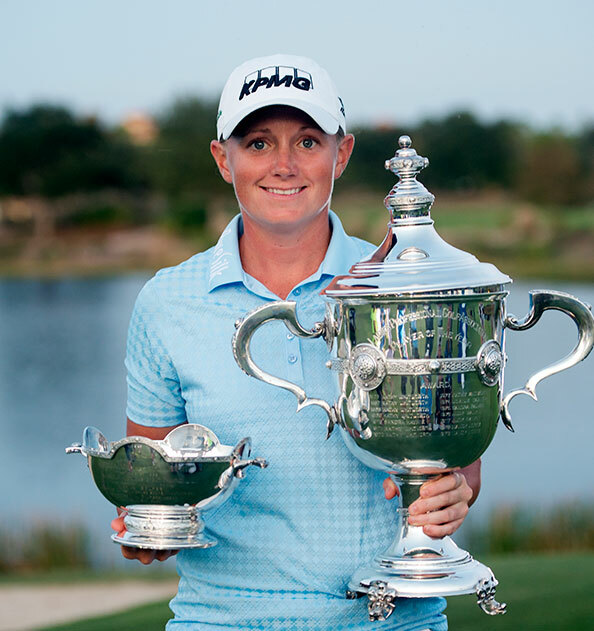 In just her third year on tour, Stacy Lewis made her first LPGA tournament win a "major" by winning the prestigious Kraft Nabisco Championship! The Kraft Nabisco is the women's equivalent to the Masters, and Stacy made the traditional leap into Poppy's Pond after coming back from 2 strokes behind to overtake the #1 ranked player in the world and win by 3 strokes! How big is this? Well, first, Stacy just moved to #3 on the LPGA Money List and #15 on the Rolex World Rankings. It also made Stacy a virtual lock to make the US Team for this year's Solheim Cup in September in Ireland! The last time she represented the US was at the Curtis Cup as an amateur at St. Andrews where Stacy went undefeated going 5 & 0. Could this portend more good things this year in the UK? 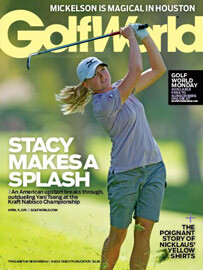 And, Stacy has gotten herself on the covers of both GolfWEEK and GolfWORLD! This spring, Stacy burst out of the gates with a 2nd place finish at the ANZ RACV Ladies Masters in Australia, followed by a top 20 finish at the Honda LPGA in Thailand and a top 10 finish at the HSBC Women's Champions tournament in Singapore. One might think that she did nothing this winter but practice. Actually, she did do some of that, however, Stacy took at trip that would change her entire perspective on life and on golf. She and her mother, Carol, joined LPGA Hall of Famer, Betsy King, on a mission trip to Africa for Betsy's charity, Golf Fore Africa where they helped children who have been orphaned by AIDS and where Stacy got to meet the little girl that she has been sponsoring in Rwanda. So, the updated version of Stacy's fascinating story. Diagnosed with scoliosis at 11, Stacy Lewis wore a back brace for 7+ years, 18 hours a day and only took it off to play golf, just to be told at the age of 18 that she had to have surgery to place a titanium rod and 5 screws her back. She thought she lost her scholarship only to have her gracious coach red-shirt her saving her a spot on the Arkansas team. She can barely lift a club for most of the year after surgery, but then comes back to win the NCAA Championship 2 years later. She then wins an LPGA event as an amateur only to be told it doesn't count because it was rain-shortened. Then she turns pro, almost wins her first pro tournament, the US Open, only to have the winnings NOT count toward qualifying for her LPGA Tour card. Undaunted, she goes to Q-school and ends up winning it but a certain 6 foot Hawaiian gets most of the attention. Then, after a disappointing rookie season and a steady but winless sophomore campaign, she goes to Africa to help AIDS affected orphans and comes back re-energized and not only wins the 1st major of the year, but does so with a heavy heart because her grandfather passes away before her first round! This story must be real because you can't make stuff like this up! Stay close because this story is not only the best story in golf, now, Stacy Lewis is also one of the very best players in golf! Read about this trip, along with all of the great articles about Stacy's Kraft Nabisco win in the "In The News" section of this site! 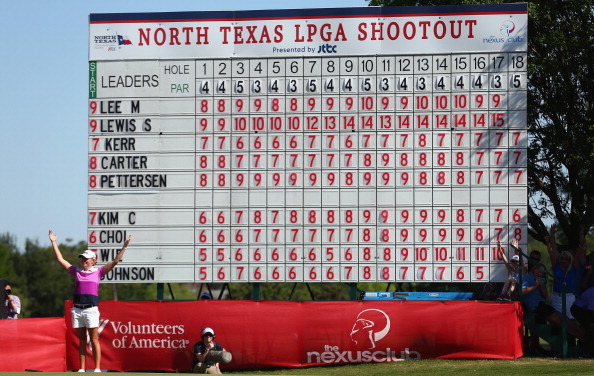 There has been no sophomore slump in 2010 for Stacy Lewis. With one tournament left to go in the season, Stacy has ascended to a place among the LPGA's elite players at #19 on the LPGA Tour Money List. She has done it with consistent play all year finishing in the top 20 twelve times. 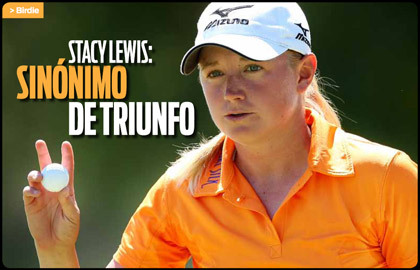 Stacy finished 2nd at the Tres Marias Championship in Mexico and 3rd at the Mizuno Classic in Japan, where she tied a course record by shooting 64 in the 2nd round. Talk about knowing how to make your sponsor happy! She has also finished in the top 20 in 3 of the 4 majors this year. All in all, it is clear that Stacy has become pretty comfortable out on tour now. So comfortable in fact that she just concluded a streak of 78 consecutive holes without a bogey, the longest such streak on the LPGA Tour this year. What is also clear is that she is knocking on the door to her first LPGA win! So far in 2010, Stacy has played in 23 tournaments in 10 countries, made the cover of another golf magazine and even appeared in a Titleist commercial. So, with all of that golf and all of that travel nearly behind her this year, one would think that she is looking forward to relaxing at home after the LPGA Tour Championship wraps up the season on December 5th? Nope, not Stacy!. She will be leaving the next day on a 2 week mission to Africa, where she will help try to better the lives of HIV/AIDS affected orphans through an organization called Golf for Africa (www.GolfforAfrica.org) that was started by LPGA Hall of Famer, Betsy King. Safe travels Stacy and congratulations on a great 2nd year on tour! What a year it was for Stacy in 2009. From winning Q-school, playing as an LPGA rookie on incredible golf courses that she had never played before, to meeting some great people on tour, and traveling to Asia for the first time, Stacy had an adventurous and rewarding first year on tour. Off the course, she did some amazing things too including filming her first ever Public Service Announcement (PSA) on behalf of her charity, the Scoliosis Research Society which was seen on TV by over 50 million viewers. She was also honored to meet hundreds of brave, young scoliosis patients all over the US and even did a scoliosis awareness outreach visit to a hospital in Kobe, Japan! And this year, she is the subject of an episode of "Athlete 360" a series on Fox Sports which profiles professional athletes who have overcome debilitating injuries or medical conditions to thrive in their sports. Even with these successes, one senses that for Stacy, there is a bit of a feeling of unfinished business. So, with a full year of LPGA experience under her belt, Stacy is determined to build upon the many great learning experiences from last year. She started her season by warming up at a pro Suncoast mini-tour event in Florida and won it, over a field of pros that included many LPGA stars. She then played the LPGA's first 2 tournaments in Thailand and Singapore and played well and followed that with 2 of the LET's (Ladies European Tour) most prestigious events in Australia. It was a good thing that she decided to go down under because she contended in both Aussie events and came away with an 8th place finish at the ANZ Ladies Masters and a 7th place finish at the Handa Women's Australian Open. This was against a stacked field full of LPGA, LET, JLPGA and KLPGA stars. Stacy continued to play strongly at this year's first major, the Kraft Nabisco Championship, where she again contended early before finishing with another top 20 result! Then, in Mexico, the week of Lorena Ochoa's retirement announcement, Stacy shot a final round 66, while playing with Ochoa, to narrowly finish 2nd, one stroke behind winner Ai Miyazato. She has started the year off well and we are very excited to see how she does as the heart of the domestic LPGA Tour schedule approaches! This spring, Stacy took on the role of being the celebrity spokesperson for the Scoliosis Research Society (http://www.srs.org), her new charity. The SRS is the largest organization of its kind devoted to supporting and funding research in spinal deformities. As a former scoliosis patient, Stacy wanted to find a way to facilitate the advancement of treatments for spinal conditions like scoliosis and to provide encouragement to those who are going through what she went through. So, Stacy shot a Public Service Announcement ("PSA") that is airing all around the country on various TV stations, and especially on the Golf Channel and ESPN2. June is Scoliosis Awareness Month so look for the PSA on TV, or go to http://www.srs.org and click on "About Stacy Lewis" and then on "Stacy's Public Service Announcement" to see it online. After winning Q-school, Stacy has been busy getting acquainted with all of the new courses and the new routine as a full time touring pro on the LPGA Tour. She is finding out that playing on tour is not just about playing tournaments. It's also about engaging with fans and giving back, something Stacy is only too happy to do. So far, she has helped build a house in Williamsburg, Virginia for Habitat for Humanity and helped raise funds and awareness for sick children at the St. Judes golf outing in Springfield, IL. CONGRATULATIONS STACY for WINNING Q-SCHOOL & earning your LPGA Tour Card!!! Amidst perhaps the strongest field ever to seek LPGA status, Stacy won the LPGA Qualifying Tournament by 3 strokes to earn one of the 20 full LPGA Tour membership spots for 2009. Now, she is considered one of the favorites in win the Rookie of the Year award next year. In order to do so, however, she is going to have to beat out a rookie class deeper than any that has ever played on the LPGA tour. Her competition includes Ji-Yai Shin (3 time LPGA winner in 2008 as a non-member), Vicky Hurst (4 time winner on the Duramed Futures Tour in 2008), Michelle Wie (former teen phenom), Mindy Kim (3 time winner on the Duramed Futures Tour in 2008) Japan's Shiho Oyama (multiple winner on the Japanese LPGA tour) and Amy Yang (19 year old 2 time LET winner) among others. 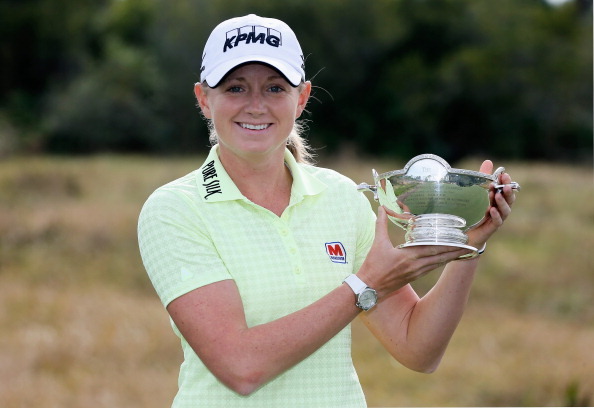 But, so far for Stacy Lewis, success in life and in golf has never come via the easiest route. Why would this be any different? So, with that mindset, Stacy is set to take on her next big challenge and earn her spot at the top of the 2009 LPGA Tour rookie class and maybe even earn her way unto the US Solheim Cup team! She also wants to thank all those people who supported her this year in her quest to get sponsors exemptions as well as those tournaments who gave her a chance to play. She especially looks forward to playing in those tournaments in 2009. Also, she extends a special thank you to her sponsors and to her friends and family in Arkansas, Texas and around the country who have helped her along the way. It wasn't all that long ago when she was wondering if she would ever be able to play golf again with a freshly implanted metal bar screwed into her back. Now, with the help and encouragement of a lot of people, she is not just playing golf again, but playing it at the highest level! Stacy's route to the top of the US Amateur rankings was not your typical golf journey. From the age of 11, Stacy wore a back brace for 7 1/2 years to correct curvature in her spine from Scoliosis. The only time that she took it off was to play golf. So, for 18 hours a day, she went to school in, ate in, and even slept in a back brace. At 18, her dedication was rewarded when she was granted a golf scholarship by the University of Arkansas. But her joy proved to be short-lived, when she was informed by her doctor that after 7 1/2 years in the brace, it hadn't worked. The curvature in her spine was measured at more than 40 degrees and would require surgery. Stacy thought that she might never play golf again. She redshirted her freshman year at Arkansas, had her surgery, and after several months of near immobility and 6 months of rehab, she began slowly swinging a club again. Demonstrating her great determination, Stacy soon earned her way unto the University of Arkansas women's golf team and in 2007, Stacy became the NCAA champion and the #1 amateur in the country. Why is Stacy Lewis the Best Story in Women's Golf?